OneDesk allows you to collaborate with all stakeholders, whether they are internal colleagues, external business partners, contractors, and customers from anywhere in the world. To help you understand how each one is done, we put together this short Q&A. Feel free to let us know if you have any more questions, and we will answer them. How do I collaborate on a project with members from the same organization? First, you need to add organization users. With the free account, you can invite two more members from your organization for free. How do I collaborate with someone who is NOT from my organization? In OneDesk, all collaboration take place within Projects. Within a Project, members are able to discuss, develop, and share information and manage feedback, requirements, issues, tasks, ideas, and help desk tickets. Projects can be shared with either users from your organization, or with external guests. How do I share a Project with external guests? When you share your project, choose share with guests external to your organization. They will be invited as external guests, and will NOT join your organization. If they do not already have a OneDesk account, they will receive an email, asking them to join and create their own organization. How do I share a Project with members from my organization? Share your Project with users from your organization: Just select the user from the drop-down list of users. If I work with individual contractors, do I need to pay for each of their OneDesk accounts? In most cases, no. Our free version of OneDesk allows users to access all of its features. Therefore, if your contractors would only need to use OneDesk for one project, you can simply invite them to create a free account and share your project with them. You’ll be able to set their permissions and give them access to only the things you want them to see in the project. If however, you need to share more than three projects with them, that would require a Pro account. What is the difference between a free account and Pro account? The only difference is that with the free account, you are limited to the number of projects you can create, the number of organization members you can invite, the number of users per organization, and the amount of storage space. View our pricing page for more details. How do I collaborate with customers? First create your customers in OneDesk Customers & Accounts app. Then, you must invite customers to collaborate with you. Once you invite them, they will receive a registration email saying that your organization has invited them to provide feedback. Once they confirm their registration by clicking on the link in the email, they can then proceed to use the customer portal. The customer portal is an application through which customers can provide feedback and directly to your organization. Through it, you can also create polls for customers to answer, allow customers to vote on feedback and ideas, and hold discussions with customers. Do I have to pay extra for the customer portal? No. It is included with both the free and Pro OneDesk accounts. How do I set up the customer portal? Only those with an administrator role can configure the customer portal. Can I give customers access to a project if I want to involve them? Yes. 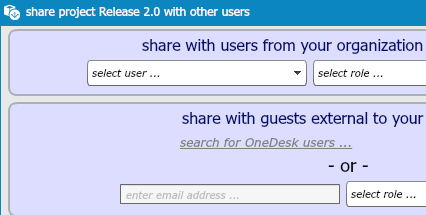 Simply invite them to open a free OneDesk account, and invite them as an external user.